Your favourite little monkey, Curious George comes to life for the first time in an all-new animated movie featuring the voices of Will Ferrell and Drew Barrymore. Discover how George the inquisitive little guy with an insatiable taste for adventure, first meets The Man with the Yellow Hat and ends up following him to the big city. George's curiosity leads him and his new human friend into lots of trouble and fun! The world's most mischievous monkey is out of the jungle out on the town and out for adventure! Before there were automated scanning machines and robotic-voice sounding librarians manning the place, I can still recall the frequent trips to the community library every Saturday with my mum and sibling. Those trips apparently transported me to a realm inhibited by colorful characters and also to a world beyond my frugal family can afford. Curious George and The Man with the Yellow Hat are among the many characters that aroused and formed the curiosity and knowledge in me. Okay I heard people complaining, let’s just skip this piece of nostalgic cheese and get on with the dvd review. Based on the original pictorial books done by husband and wife team, Margaret and H.A. Rey decades ago, the movie version finally came to the big screen early this year. 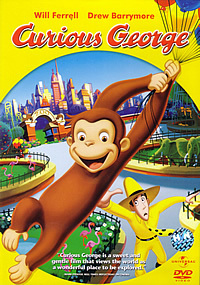 Produced by fame Director Ron Howard (“A Beautiful Mind”, “The Da Vinci Code”), “Curious George” follows the adventures of a cheeky cute primate named George, in the big city and his down-to-earth, shy owner Ted dubbed The Man with the Yellow Hat. Since the primarily target of this animation is for the kids, do expect frequent interruption of song routines and of course, a rather simplistic storyline. Not that it matters really, it has been a long while since we are exposed to such an innocuous, pure child-like entertainment and free of pop culture references production. Voiced by Will Ferrell (in a rather subdued and surprisingly effective tone), Drew Barrymore as Ted’s love interest and Eugene Levy (that wacky dad in “American Pie” series) as a wacky (again!) scientist. Perhaps the little ones who are fed on today’s 3D animation (point one) might not appreciate the hand-drawn factor of “Curious George” which explains the straight-to-video fate here. At the end of the day, the movie scores not only for it’s nostalgic factor in fact it’s a great substitute for the kids today who are exposed to (see above point one) and heavy doses of game consoles. Parents should seriously consider this dvd as an early Christmas present. Contains a "Barbie in the 12 Dancing Princesses trailer" and a 4 minutes segment called "A Very Curious Car". Listen to the animators discussed about designing Ted's red Volkswagen. Pretty interesting but we want more! Although the animation is 2D and supposedly hand-drawn, the visual transfer on this disc is pretty much on the whole free of dirt and specks. And of course the luxury of hearing George, I mean Ted speaks in perfect Mandarin or Thai.